Over 6,500 yards from the back tees, this challenging, yet fair 18 hole track is enhanced by tight manicured fairways and challenging green complexes. Probably the most demanding hole at the Desert Rose Golf Course is the Par 5 fourth. At 607 yards, this long and tight par 5 has out-of-bounds on the left and water on the right. Like many of the holes at “The Rose” this par 5 will test your skills as well as your mental toughness. Gold Buckle Champion will be hosting a golf tournament on November 5, 2011 at the Desert Rose Golf course to benefit the UNLV Rodeo Team, the Horses 4 Heroes, and the Gold Buckle Champion programs. Please plan on joining us for great fun, great prizes, and tons of FUN! 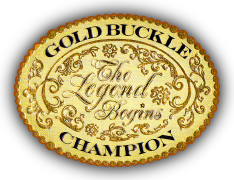 [slideshow id=4] Gold Buckle Champions…. to further the education of equine health and safety while preserving our western heritage and history by means of promoting equine events incorporating the youth and community. Horses 4 Heroes….. is the leading family horseback riding non-profit organization that enriches lives and empowers our youth by offering able-bodied, affordable horseback riding programs that emphasize fun and safe activities with horses, mounted and un-mounted for all ages. Participants learn valuable leadership and teamwork skills, make new friends, and develop a lifelong love of horses! UNLV Rodeo Team…. is very proud of its elite status in the ranks of the National Intercollegiate Rodeo Association. Numerous consecutive championships at the regional level, as well as National Championships in 1999 and 2008, have allowed the Program an opportunity to recruit the nation’s best student-athlete’s. We believe that our program allows students to receive a great education and build character while pursuing their rodeo goals The cost of tuition, practice stock, feed, travel, and day-to-day operating expenses required to maintain and continue the winning tradition are high. Any donation is greatly appreciated no matter the size or type. Logo Placement on banner, entry forms and all arranged advertising for the event.